A United Launch Alliance Atlas V rocket blasts off from Space Launch Complex-41 with NASA's Mars Science Lab rover Curiosity. This is ULA's 56th successful launch in 60 months. ....and two highly reliable launch systems, Atlas and Delta. ULA's unparalleled recipe of experience is built on the Atlas and Delta legacy of 1,300 launches during the past five decades, propelled by ULA employees and suppliers located in 46 states. 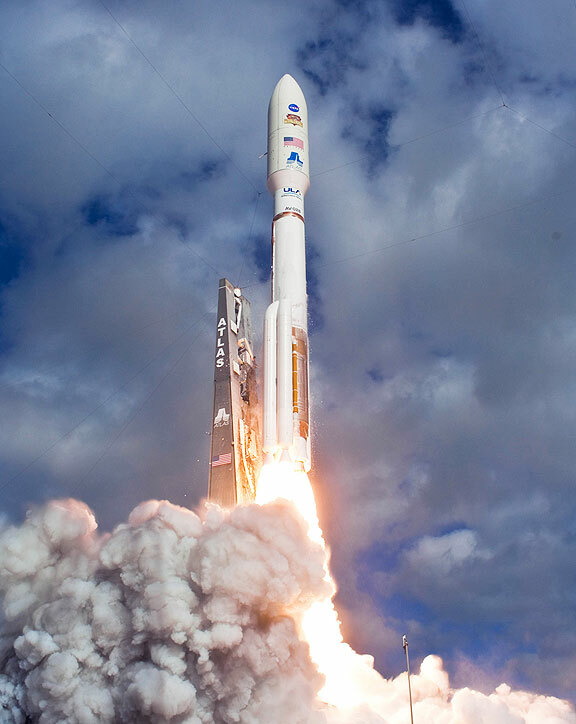 ULA's impressive record of success lies in the 56 successful launches the company has achieved in just 60 months. In total, ULA has launched 30 national security missions, 17 NASA missions and nine commercial missions. "We're very proud of the record ULA team has amassed over the past five years," said ULA President and CEO Michael Gass. "Just this year, ULA has launched 11 missions with nearly 20 billion dollars of critical, irreplaceable assets, all of which were safely delivered to orbit. Most recently, we launched five science missions for NASA in six months." The evidence of ULA's success is literally on orbit. Every Global Positioning System satellite, every missile warning satellite, nearly every intelligence collection satellite, weather satellite and military communications satellite, as well as nearly every major NASA science mission-from Mercury to Pluto-has been launched successfully on a ULA or ULA heritage launch vehicle. Since its formation five years ago, ULA has made significant progress in reducing the size of the company and making it more efficient. Compared to the heritage systems, Atlas, Delta and Titan IV, the Evolved Expendable Launch Vehicle (EELV) systems have reduced costs by greater than 25 percent. ULA also has consolidated from five major manufacturing sites down to two sites, as well as reduced our footprint and our employment levels by more than 20 percent from the pre-consolidation point while increasing output at the same time. Next year holds another busy manifest, with 11 launches scheduled at Cape Canaveral Air Force Station in Florida, and Vandenberg Air Force Base in California. In addition to the satellite market, ULA is continuing its role in commercial human spaceflight and progress in human-rating the Atlas V vehicle to launch crews to the International Space Station. "The Atlas V vehicle is the lowest risk approach to developing a commercial crew capability over the next several years," Gass said. "Atlas V is the launch vehicle of choice of three of four Commercial Crew Development (CCDEV) teams, including Boeing, Blue Origin and Sierra Nevada." "ULA program management, engineering, test, and mission support functions are headquartered in Denver, Colorado. Manufacturing, assembly and integration operations are located at Decatur, Alabama, and Harlingen, Texas. Launch operations are located at Cape Canaveral AFS, Florida, and Vandenberg AFB, California.